Jammu & Kashmir Current Events - Tourists and Filmmakers would be charmed by Tulip Garden: Omar Abdullah & Governor Reconstitutes Shri Mata Vaishno Devi Shrine Board. 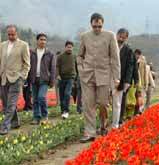 Srinagar, March 24 – Chief Minister Mr. Omar Abdullah has expressed hope that tourists from all over the country and abroad would visit the Tulip Garden at Srinagar in the days to come to enjoy the fantastic charms provided when about 12 lakh tulips of different varieties and colours would be in full bloom. Mr. Abdullah was the first to purchase ticket today morning when the garden was formally thrown open for public this year. He also posed for photographs with a group of tourists from Karnataka, who were very glad to be in the garden when the Chief Minister was there. Jammu, March 24 – Governor, Mr N. N. Vohra, has reconstituted the Shri Mata Vaishno Devi Shrine Board (SMVDSB), for a period of three years, with immediate effect. Talking to media persons, the Chief Minister said we want people from all over the country to visit this garden during the next fifteen days when the garden would be at its peak and offer a breathtaking attraction to the visitors. He said the filmmakers from Mumbai should also give a thought to shoot their films instead of going to Europe. He said the garden was started by his predecessor Mr. Ghulam Nabi Azad and is likely to develop as a major tourist attraction in the coming days. Mr. Abdullah said that there is need to expand the garden which is spread over 35 hectares and where 12 lakh tulips of 70 varieties have been planted. He also stressed the need for developing the Botanical Garden adjacent to the Tulip Garden, adding there is ample scope for commercialization of floriculture. In response to a query, the Chief Minister said foreign tourists, despite travel advisories, visit the State and enjoy its charms. The travel advisories by certain countries, the Chief Minister said, is preventing visit of foreign tourists to the State in large numbers. He hoped that these advisories would be withdrawn in keeping with the improvement in the situation. Responding to another query about revocation of AFSPA, the Chief Minister said it was not an overnight development but with the improvement in situation it could be reviewed. He said the Union Home Minister, during his recent visit to State, had echoed the same and said after Lok Sabha elections it would be discussed. Speaker, Legislative Assembly, Mr. Mohammad Akbar Lone, Political Advisor to Chief Minister, Mr. Devendar Rana, MLA, Mr. Nasir Aslam Wani, senior officers and a large number of tourists were present on the occasion. Earlier, Principal Secretary, Agriculture Production and Floriculture, Mrs. Sonali Kumar threw open the garden for public. The garden, which was inaugurated on March 29, 2008, was visited by about 80,000 visitors last year. In his capacity as Chairman, SMVDSB, the Governor, in exercise of the powers conferred upon him under section 4(1) (b) of the Jammu and Kashmir Shri Mata Vaishno Devi Shrine Board Act, 1988, has nominated Mr E. Sreedharan, Managing Director, Delhi Metro Rail Corporation, New Delhi; Pt. Shivkumar Sharma, renowned Santoor maestro; Ms. Sudha Murty, Chairperson, Infosys Foundation, Bangalore; Dr. Sudhir S. Bloeria, former Chief Secretary J&K and Advisor to Governor; and Mr. Justice Tirath Singh Thakur, Chief Justice, High Court of Punjab and Haryana, Chandigarh, as Members. Mr. E. Sreedharan, Managing Director, Delhi Metro Rail Corporation, born in Palghat district of Kerala, is fondly called the “Wheel of the Nation”, for having changed the very face of Indian public transport by his tireless work in building the Konkan Railway and for his outstanding achievement in establishing the Delhi Metro before the scheduled date and to progressively expand it to cover adjoining areas in UP and Haryana. Mr Sreedharan’s first major challenge came in 1963, when a tidal wave washed away portions of the Pamban Bridge, connecting Rameshwaram with Tamil Nadu. Against the target of repairing the bridge in six months, he restored it in a mere 46 days and was honoured by the Railway Minister’s Award for this achievement. He was also associated with the country’s first Metro Rail project in Kolkata for a few years. He served as the Chief Engineer, Southern Railway, for seven years from 1981, became its General Manager in 1987 and Member of the Railway Board in 1989. Immediately on his retirement, the Government appointed Mr Sreedharan as CMD of Konkan Railway in 1990, which project was an outstanding success. He took over as Managing Director of Delhi Metro in 1997 and completed it in 2002, well ahead of schedule, making it a milestone of construction history. Mr. Sreedharan was awarded the Padma Shree in 2001; named the Man of the Year by The Times of India Group of Newspapers in 2002; named as one of Asia’s Heroes by the TIME magazine in 2003; honoured with the Chevalier de la Legion d’Honneur by the Government of France in 2005. In 2008, he was honoured with the second highest national award, the Padma Vibhushan, for his most outstanding service to the nation. Pt. Shivkumar Sharma, an internationally acclaimed Santoor maestro, has the distinction of bringing forth the folk instrument from the Valley of Kashmir to its classical status. Pt. Shivkumar Sharma appeared for his first national level concert in Mumbai in 1955; this marked a turning point in his career. With his creative genius, the maestro has created a new genre of instrumental music. Through his performances spanning over half a century, he has created millions of new listeners and ardent fans of Indian classical music around the world. Pt. Shivkumar Sharma believes in the immortality of this great heritage of classical music and wishes to spare no effort to make it so. With this aim in mind, he has been imparting knowledge to create the next generation of musicians, in Guru Shishya tradition, who come to him from all parts of the country, as well as various parts of the world like Japan, Germany, Australia and America. He has made a name in Bollywood as well by providing everlasting hits like Silsila, Lamhe, Darr etc. Pt. Shivkumar’s presentations are meditative and soothing. His reverence for the ancient wisdom of Vedanta and Upanishads has resulted in his creating a special album of music for Shlokas from the Upanishads. For his vast spectrum of achievements, Pt. Shivkumar Sharma has been honoured with many national and international awards and honours which include: Honorary Citizenship for the City of Baltimore, USA; Sangeet Natak Academy Award; Maharashtra Gaurav Puraskar; Honorary Doctorate from the University of Jammu; Padma Shree (1991); Ustad Hafiz Ali Khan Award (1998); Padma Vibhushan (2001); Tansen Samman (2004); Master Deenanath Mangeshkar Award (2005); he was also honoured by House of Representatives of the State of New Mexico in 2007; International Cultural Ambassador Award by World Bank in 2007; and Honorary Degree of Doctor of Letters of the Indira Gandhi National Open University in 2008. Ms. Sudha Murty, is Chairperson of the well known Infosys Foundation which she set up in 1996. While she is the wife of the legendary Mr. Narayana Murthy, she is a very highly educated and widely respected person in her own right. She holds an M. Tech in Computer Science from the Indian Institute of Science, Bangalore, and has been very actively contributing to the social upliftment of the poor and the neglected, under the aegis of Infosys Foundation. While she continues to serve as a part-time Visiting Professor in Computer Science, she works as a whole time social worker. She is particularly well known for her signal contribution in the medical and educational sectors. After having visited over 800 remote villages in Karnataka, she is implementing a unique project to equip the schools in these villages with a computer and a library. 3001 such libraries have already come up and several hundred schools have been provided computers by her. Ms Murty has also been instrumental in building hospitals in the backward rural areas in Karnataka and other States, including Leprosy treatment and rehabilitation hospitals, Burns hospitals, Cancer hospitals and Relief Centres. She has plans to build 1000 toilets in Bangalore City. A philanthropist, teacher and writer, Ms. Murty is the recipient of dozens of prestigious honours and awards which have been conferred on her within the country and by several foreign countries. These included Padma Shree Award in 2006; Karnataka Rajyotsava State Award for achievement in the field of social work in 2000; Computer World International Level Award in 2001; World Millennium Award 2000-Karnataka Conference at Houston, Texas, for her contribution to philanthropy and literature; Millennium Mahila Shiromani Award for excellence in social service; Golden Peacock Award; International and Area Studies Global Leaders Award, University of California, Berkeley; Kesari Gaurav Sanman by Kesari Foundation, Mumbai etc. She was also voted as “Woman of the Year” in 2002 and honoured with “Rajalakshmi Foundation Award” in 2004. She was also conferred with Honorary Doctorates by the Gulburga University; SNDT Women’s University, Mumbai; Karnataka University, Dharwad; Sathyabhama Deemed University, Chennai; and Shivaji University, Kolhapur. She has written 13 books, some of which are widely read technical books. Credited with a distinguished administrative career in the I. A. S., Dr. Sudhir S. Bloeria, has also served in the Army as a Commissioned Officer. Before taking over as the Chief Secretary of Jammu and Kashmir, he was Director, Enforcement Directorate, in the Ministry of Finance, Government of India. He also served as Advisor to the Governor during the period of Governor’s Rule (2008-09) in J&K. Awarded a Ph. D in 1995 for his research on “The Battle of Zoji La-1948”, Dr. Bloeria is the author of several well known books on military history. He is associated with several social and cultural organisations in the State and has been working for the uplift of the under-privileged sections of the society. Mr. Justice Tirath Singh Thakur, who commenced his practice in the High Court of Jammu & Kashmir, was elected as President of the Bar Association, Jammu, in 1986. He was appointed as Additional Judge of the High Court of J&K in 1994 and was transferred as a Judge of the High Court of Karnataka in 1994 where he was appointed as a permanent Judge in 1995. He moved to the High Court of Delhi in 2004 and was appointed as its Acting Chief Justice in April 2008. Mr. Justice Thakur was elevated as Chief Justice of Punjab and Haryana High Court in August 2008. Mr Justice Thakur has served as a member of the Law Faculty of the University of Jammu and as a member of the first University Council of the Shri Mata Vaishno Devi University. Hailing from a well known family of Jammu Province, Justice Thakur is known for his keen interest in societal change and balanced socio-economic development.